CNY Lou Sang with a Japanese Twist! Everyone is getting into the coming Chinese New Year festive mood with auspicious Lou Hei! Joining the CNY festive trail is Xenri Fine Japanese Cuisine. The Japanese restaurant, which has two outlets – D’River View and D’Terrace, has whipped up their own Japanese version of Yee Sang this festive season. It’s a perfectly great excuse to enjoy the auspicious tossing of Yee Sang with Japanese seasonal ingredients. Thanks to a dear friend, Merryn, I was invited recently to see what Xenri has in store for this festive New Year. 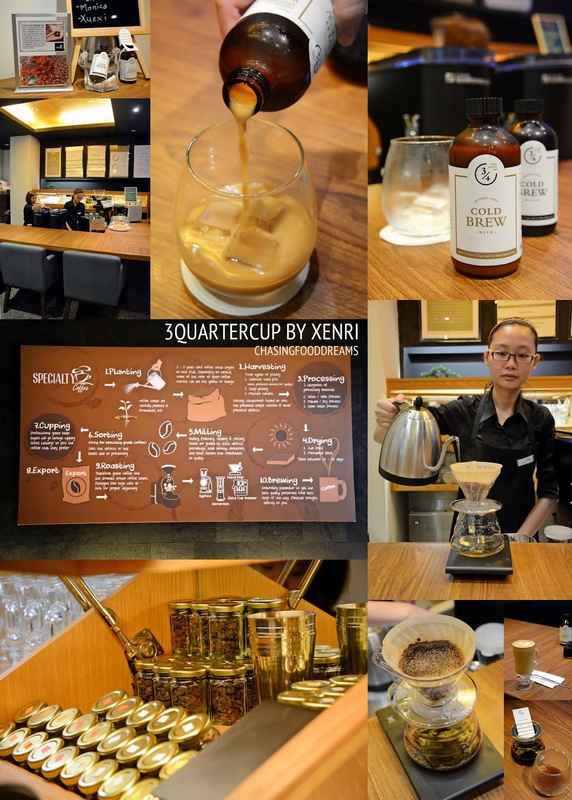 We visited their Xenri D’River View outlet located at Wisma Elken in Old Klang Road on fine Saturday afternoon. The location is pretty good and easy to find and since it was a weekend, there were plenty of parking. Xenri is no stranger to our F&B scenes. The Japanese restaurant is famous for their fine Japanese cuisine with Kaiseki-style fare, a la carte and of course Japanese buffet. This is not my virgin visit as I have had quite a few visits with my family over the years. We had always enjoyed our experience here and thought that Xenri dishes are value-for-money for such fine Japanese dishes. Walking into this outlet, we were greeted by the serene and Zen-inspired interior and ambience. There is the main dining area that has a Sushi bar and lots of privately sectioned rooms on another end for more private dining. So this festive season, these rooms are just perfect for your own parties with friends and families. Xenri is featuring three Chinese New Year Yee Sang this year to usher in prosperity, luck and wealth with Organic Apple Yee Sang, Jelly Fish & Salmon Yee Sang and Xenri Premium Yee Sang. Prices are RM68, RM98 and RM128 respectively. First up, the Organic Apple Yee Sang is perfect for those who wish to go light minus the usual raw fish. There are plenty of ingredients such as crisp fresh green apples, three types of seaweed, tempura flakes, pomelo sacs, pickled ginger and the usual vegetables together with peanuts and sesame seed. This yee sang has an organic apple dressing to add more fruitiness to the salad. It’s very refreshing and bright in flavours and there are lots of crunch and crisp textures. The Jelly Fish & Salmon Yee Sang has similar ingredients minus the apples but with added fresh salmon slices and crunchy jelly fish. The dressing is a light and fruit plum sauce dressing. If you are a big sashimi lover, then go all out for their third one of Xenri Premium Yee Sang which has 5 types of fish – salmon, butterfish, red tuna, amberjack and jelly fish. It’s certainly an auspicious salad with so many fish! 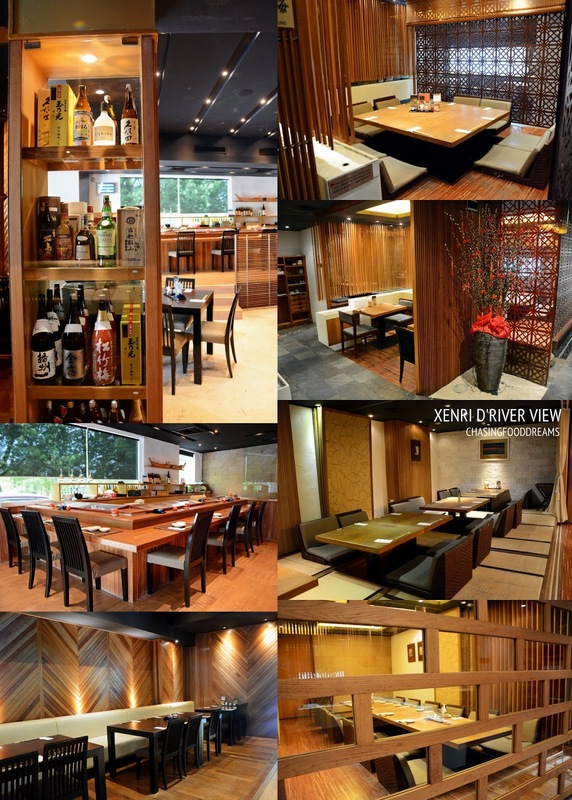 Besides Yee Sang, Xenri D’River has an extensive a la carte that showcase their fine Japanese menu. These are available during lunch and dinner. If you love to be surprised, then go for their Kaiseki-style meal where Xenri’s chef will feature specials of the day for your meal. Edamame is almost an essential part of every Japanese meal. Another authentic Japanese ingredient is Natto. Our plate was called Morokkyu, which has Natto and crunchy Japanese cucumber as a pairing. If you are a die-hard oyster fan like me, their Kaki Nezuyaki or Grilled Half Shell Oysters with Cheese is pretty good and has a good dose of creamy cheese gratin. Makis are my all-time-favorite to enjoy because they feature quite a few ingredients all beautifully dolled up in a roll. We had Xenri’s Dragon Maki, Hawaiian Maki and Spicy Salmon Maki which were really so pretty to look at as well as delicious. Dragon Maki has eel and avocado while Spicy Salmon has salmon, salmon roe, crab stick and a spicy sauce. Both are classic favorites. Hawaiian Maki is the pretties of the lot and features mango with tempura prawns and ebiko. These are pretty much winning combinations and very easy to enjoy. We also had some classic grilled items such as Unagi Kabayaki and Saba Shioyaki. Both equally prepared to perfection. I was told that Xenri offers a special beef called Meltique that equals the prime Wagyu but without its hefty price tag. So we ordered their Meltique Beef Teppanyaki and requested for cube cuts for the beef. And we were not disappointed as the Meltique beef was gorgeous. Apparently, Meltique beef also has a good ration of marbled fat, making the beef so tender and very divine in taste. It is so juicy and flavourful. Despite the minimal seasoning, the beef is scrumptious together with the sautéed mushrooms, asparagus, vegetables and garlic chip. A Must-order! We finished our meal with Yuzu, Goma, Green Tea, Vanilla and Chocolate Ice Cream. My favorite has to be the Yuzu Ice Cream for its super refreshing citrus taste. Jalan Klang Lama, 58000 Kuala Lumpur. I just had Japanese yee sang over the weekend too, very yummy!